I’m on my way to Bay Area Now 8 at the Yerba Buena Center for the Arts. I’m early, I’m almost always early. So in an email I’m spending these spare moments writing some thoughts before I get there on a grey late summer morning. I remember the last of these quite well - I didn't love it though there were good and bad bits of it. Which essentially could serve as an adequate review of any such -ennial I suppose. That edition took the well-meaning position of inviting spaces instead of artists, who in turn curated little shows. The results were mixed, with a few highlights here and there. Many of those spaces have closed in the time since, including several that were some of the most consistently high quality and intriguing in their time. But it's Bay Area Now, not Bay Area Now and Forever, so that times have changed in the intervening years is not a strike against that particular exhibition. I’m sitting on a bench in front of the Jewish Museum, next to the construction site of the long-delayed Mexican Museum with ten or so minutes left till I was supposed to arrive for the press preview. Across the street are the Museum of the African Diaspora, SFMOMA, and YBCA, I’m struck by what our local institutions have been, could have been, what they could be. Eventually I give up arriving on time, head in a bit early. There's coffee and snacks and bottles of water which I avail myself of. Then a little introduction from the curators, then a walk through with many of the participants there to give brief outlines of the work - it's a generous experience, and in a sweet way many are a bit nervous, this being their first or one of their first institutional exhibitions. The walk through takes up most of the time before I have to run off and wear a different hat, but I managed to get a pretty good first impression of the thing. I may add to this document; I'm returning to the show for the opening tomorrow which should be super energized and full of people and in the inverse of the typical 'it was too full of people for me to see the work' feeling, I think it'll add value to the thing to see it activated with at least two of the works to be performed on/with during the event. There is much to love in this Bay Area Now 8. My first take on this took a bad-news-first angle, but this text a bit of a slog for you, my kind reader, to get through, so let’s start with the positive instead. It is hard to pick highlights because there are so many. One room in particular stands out: the smaller (but still large enough) of the main floor galleries has works by Andrew Wilson, Nicki Green, Josh Faught, Marcela Pardo Ariza, and Sita Kuratomi Bhaumik. Not all necessarily produced for the show, each of these artists combine research and craft into deft, surprising investigations into complex notions of identity. It's great stuff, the individual practices not necessarily improved by the hang (they are strong enough on their own) but a vision of Bay Area life and art in all its perils and potentials is strong in this room. 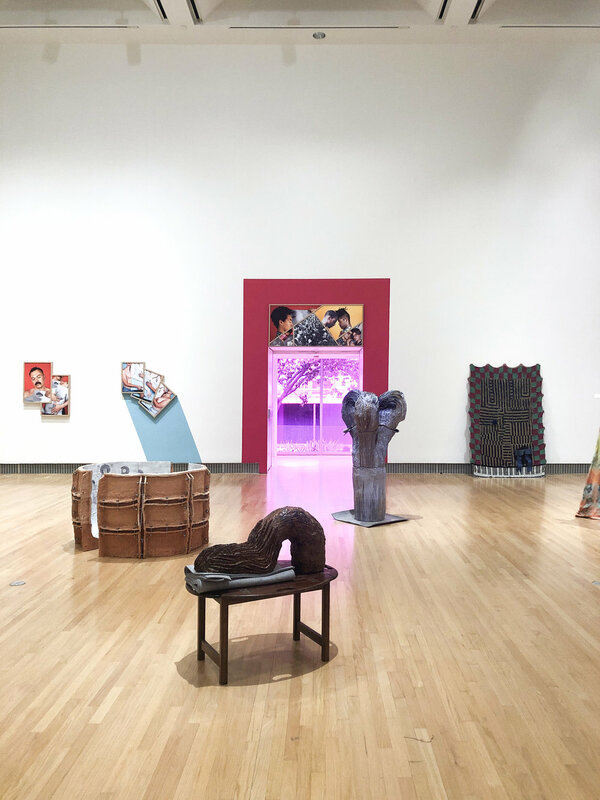 This gallery connects through a regular door and through, as is often the case in shows at YBCA, a strange window-passage wherein an installation by Sadie Barnette sits bathed in pink light due to gels covering the windows. A plastic-covered couch is flanked by the words ‘From Here’, each letter punctuated on its ends by plastic jewels; a small framed portrait of a young woman (the artist?) hangs over the couch. It’s a bold, honest work that doesn’t stutter in speaking to passers by on Mission Street - whose place is this? How do we respect the legacy of those who live in a place despite the power of those who 'own' - property owners and developers rapidly remaking the are for a people to come at the detriment of those who've come before? In the large main space there is also some great work; at a glance the show in general is a handsome thing, something we can be proud of. Charlie Leese’s large group of sculptures, at once three pieces and a single installation builds upon the achievement of his work in the recent Southern Exposure group show. 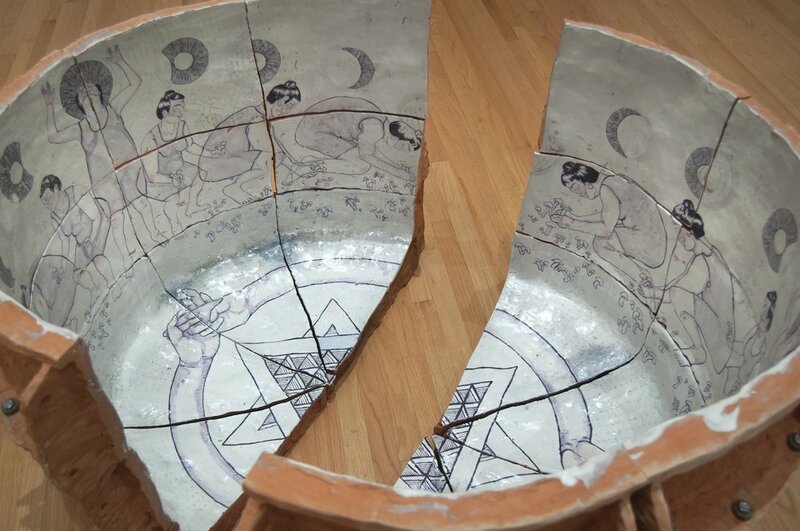 In a nearly opposite area of the gallery, Carrie Hott’s tabletop installation upstairs near the theater continues her success translating her research interests (this time the US-Japan internet cable) into engaging sculpture. Some of the projects will require some time more time – longish films by Sofía Córdova and David Bayus, the virtual reality of Rhonda Holberton’s installation, Porpentine Charity Heartscape’s video game. I liked the bits of each I managed to peek at. And fortunately for the short of attention span, each manages to be intriguing as an installation. For Bayus and Holberton, I’d in the past suggested a less-is-more direction towards their installation making and I’m happy to say that ignoring that advice has yielded strong presentations. 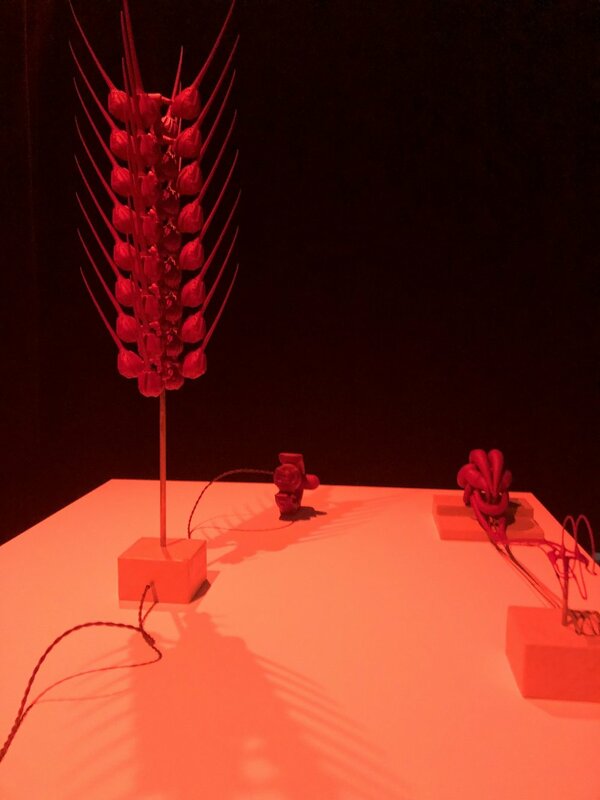 Holberton’s Again for the First Time in particular is impressive – a virtual Reiki session well-worth visiting the show on a slow weekday to experience it in a peaceful setting. The manner in which Bayus and Porpentine’s work is installed in the upstairs gallery is less than ideal, with a black curtain cutting the space in two, but their works each still manage to hold their ground. Some other works will make a bit more sense seen again, or activated. Andrew Wilson’s installation is to be worked on, performed of the course of the exhibition - the artist continuing work on a series of kaftans with prints of a slave ship illustration used prominently by abolitionists. At the opening, Caleb Duarte's large scale sculptural installation will be activated by students from the Fremont High School Newcomers Program. And Constance Hockaday has a small installation upstairs, but its mainly a placeholder whereat input can be left to inform performances later in the run of the show. The contributions from the various architectural firms/think tanks etc. are generally speaking the least successful bits and some feel a bit dated. A science-experiment-lite outside by Hyphae Design Laboratory (a designer of living roofs/walls among other things), Pprophet, allowing visitors to urinate and have that urine transformed into water for plants and fertilizer is very lite beyond its obvious transgression of semi-publicly using the thing. A beautiful work by NEMESTUDIO has content – the myriad abstract 3d rendered objects in its video and printed canvases are refuse as the work has something to do with trash and/or the environment, but the resulting work simply aestheticizes the lot of it. Urban Work Agency’s A Seat at the Table, with its overlays of shapes of important tables and games they’ve designed and data visualizations is at the very least intriguing – but broadly speaking, these installations are a bit similar to the run of upstairs exhibitions recently engaging with architecture and design which though endowed with a certain liberal political charm seem no more likely to affect change that the more abstracted or personal productions of artists (allowing for the fields to be so strictly divided I think is a mistake I’m making maybe worth thinking about more deeply). It is notable that though earlier iterations of Bay Area Now had separate categories for performance and film, BAN8 has forgone this. There is a fair amount of video in the show, but the lack of a film program accompanying the show, and of a robust performative element is noticeable. It's a good show. Bay Area Now 8 is good. Having recently seen Made in LA and mostly liked it, I was surprised to encounter a general distaste for the exhibition amongst all of my Los Angeles friends for a wide variety of reasons. Perhaps this speaks to the lack of criticality of our little scene, but I have a hard time imagining anything but glowing reviews from the artists, curators, and writers here. Including me - I could go on and on about a few more problem areas of the show but I could speak at even greater length about the things I love in the show.